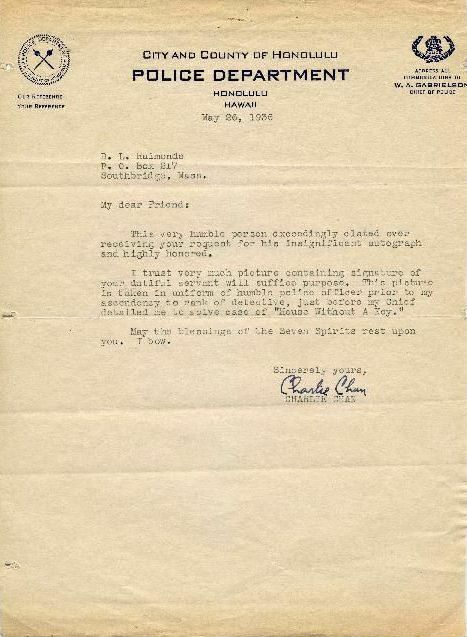 This letter was written and signed by "Charlie Chan" and sent by the Honolulu Police Department to a fan of the detective. By this time, Charlie Chan was extremely popular and the Honolulu Police Department doubtlessly received many letters addressed to Charlie Chan. The following letter was certainly typed and written by an officer of the department assigned to this interesting duty. The mention of an enclosed "picture containing signature" of Charlie Chan before his "ascendency to rank of detective" may indicate that the photograph was that of a young Chang Apana, the "real" Charlie Chan, whose fabled exploits had inspired mystery writer Earl Derr Biggers to write The House Without a Key in 1925.
detailed me to solve case of "House Without a Key."